More Christmas Goodies: Reading Accessories Edition – my books. my life. I got several book-related Christmas gifts that I’m super excited about and want to share with you all. I first heard about reading wedges on twitter. 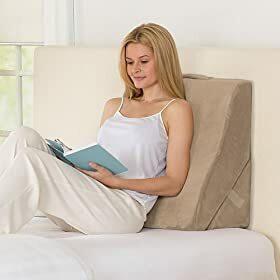 I’ve been having trouble finding a comfortable reading position because my back has been just generally sore lately and I think my poor posture while reading may be part of the problem. So the solution was to ask for a reading wedge for Christmas. My mom bought me the Brookstone Bed Wedge Pillow and I’m already in love with it. I carry it from my bed to the couch to the chair and basically use it wherever I go. It has made sitting down and reading a book or watching tv or typing on my laptop much more enjoyable. Another problem of mine has been that I married a high school teacher who gets up very early in the morning. This generally means that he goes to bed much earlier than I do. Now, thanks to my new LightWedge reading light, instead of going to sleep at an absurdly early hour, I can happily read the night away without bothering him. I wanted this type of book light because I thought it would be subtler. I have only used this in the car so far and it seemed a little bright for the driver (although Ben kept telling me it was fine). I will test it out further next week when school starts back up. This was a gift from my in-laws who generously gave me both the original and the paperback size. Finally, and what might be my favorite gift of all, is my University of Michigan Snuggie. It’s another gift from the in-laws (my mother-in-law went to Michigan State so she must really love me). I know you all are thinking, “what does Michelle need a snuggie for, she lives in Florida and it’s never cold there.” Well, (a) I currently have the heat on and while it may not be freezing, it is definitely chilly, (b) I am always cold and the air conditioning is usually set way too low for my comfort, and (c) you can put that maize “M” on anything and I will use it. If only I had a bowl game to watch while wearing it. [Do you think that’s why the guy in this picture looks angry?]. And there you have it: my reading accessories. I’ve been in a little bit of a reading rut these last few weeks, so hopefully the opportunity to use these new toys will get me reading again. Did you get any fun reading-related gifts over the holidays? I bought myself plenty of books with the gift cards I received, and I’m definitely looking forward to reading them. I have that book light too! Only mine is just the paperback size, so it makes reading larger books a little more challenging. I’ve had it for several years now and it’s still useful. I need to get one of those pillow wedges though, that looks great! Wonderful! I love the LightWedge reading light! I am tempted to get one too 🙂 The bed wedge pillow also looks wonderful! The bed wedge pillow looks great! Ooooh that reading wedge looks so comfy! I have the same problem and think I totally need one after reading your post. I didn’t get any reading accessory gifts, but I have a book light already that I love because my boyfriend seems to need way more sleep than I do and I hate having to go to bed when I’m not tired. Pingback: The Sunday Salon 8.15.10 - my books. my life.